Summer is approaching and I can't wait to live in dresses! This one in particular caught my eye from a mile away for many reasons. I love a good maxi dress, the geometric print is so much fun and I'm obsessed with the colour combination of what looks like subtle faded neon's. This dress is like wearing PJ's it's so comfortable, you'll want to wear it everywhere. I for one see this as the perfect go-to dress for a day headed to the beach. I have been on a hunt for a couple great maxi skirts to get me through the summer and this one was a hit! The black and white horizontal pinstripe turns this skirt into a perfect grey that can worn with a whole lot of everything. The maxi skirt is so effortless yet chic and for a shorty like myself I certainly don't mind the illusion of height it gives me! I paired this skirt with a fun vest that's a unique twist to the trending bra top right now. The best part about it was the thick elastic crossover back. Good thing you are already aware of my maxi obsession for summer!! Another trend that I always love for summer are stripes and how great are the different variations used in this dress? Pairing pink with orange is a combination that I'm a huge fan of and perfect for the summertime. 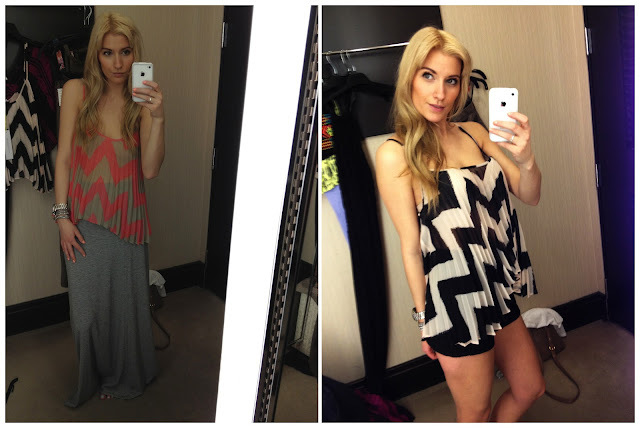 I think these camis are great to have for the warm months ahead. The zigzag pattern is just another print to add to the collection the season and it comes in two colour combinations to choose from. The sunburst pleating creates more dimension giving you something a little different in your wardrobe. The great thing about these tops are their versatility. I've shown these tops in a more casual wear but throw these on for work under a great blazer and you have something with a punch of fun to change things up in the office! I love these shorts! Not only do they meet my seasons criteria of bright neon's but how fun is this embroidered print?! These are casual shorts that I could see myself reaching for pretty much any dress down kinda day! Here is a sneak peek at what I pulled for a recent creative I styled. Stay tuned! I'll be posting the shots soon! !